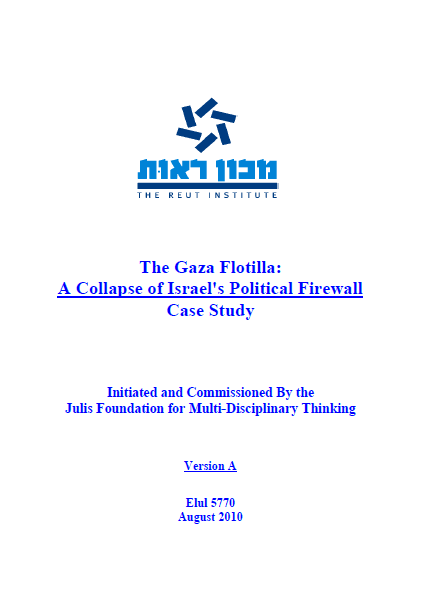 This case-study deals with a strategic political strike against the State of Israel that was planned without interruption since February 2009 and materialized on May 31, 2010. Known as the Gaza Flotilla, this effort exceeded the expectations of its organizers in causing tangible and significant damage to Israel. Planning of the Gaza Flotilla was carried out over the internet and in public conferences by non-governmental organizations (NGOs) primarily operating from major cities of countries friendly to Israel, including London, Dublin or San Francisco. In the broader context, the Gaza Flotilla was just the tip of the iceberg. It is one incident out of many in a campaign entitled ‘Lifeline to Gaza’ designed to break the ‘siege’ of Gaza. The campaign itself is one of several being waged against Israel. Others include the Boycott, Divestment, Sanctions (BDS) Movement, the ‘lawfare’ strategy, and the Durban conferences. This attack is executed by two forces, acting in parallel and with cooperation. The first is the Resistance Network, led by Iran, Hamas, and Hezbollah, that rejects Israel’s right to exist based on Arab and Islamist nationalist-religious ideology. The second is the Delegitimization Network, which is primarily concentrated in a few major cities such as London, Brussels or the San Francisco Bay Area, and denies Israel’s right of existence based on political, philosophical or historical arguments. Both sets of ideas are increasingly sophisticated, ripe and coherent, even if there is no evidence that they represent an explicit strategy with operational objectives, timelines, or milestones. – Tying Israel’s hands in contending with Hamas in Gaza (or Hezbollahstan in Lebanon) – While the Resistance Network works towards strengthening the ‘Hamastan’ or Hezbollahstan models as a front for its ideological and military struggle against Israel, the Delegitimization Network ties Israel’s hands by constraining its political and military maneuverability and by granting legitimacy to Hamas or Hezbollah. 11. These groups are leading a systemic and systematic attack against Israel’s political and economic model, which has already had strategic consequences and may become existential if ignored or inadequately addressed. 12. Moreover, Israel suffers from strategic conceptual inferiority in contending with this threat. In other words, Israel has no effective response to the challenge it faces. This inferiority has caused Israel to repeatedly suffer from political and diplomatic disappointments, despite evident quantitative and qualitative military, technological, and economic superiority. For example, Israel’s ability to defend itself militarily has been compromised; its sovereignty has been challenged by increased international involvement in its domestic issues and the leveraging of universal jurisdiction against it; and it faces the risk of boycotts. – Cultivating Israel’s own network on the basis of the diplomatic establishment and a network of ‘informal ambassadors’ comprising of individuals and NGOs. 41. ‘Re-branding’ Israel is critical for the battle against delegitimization, as well as for Israel’s ability to communicate its messages effectively and for disrupting the Delegitimization Network’s ability to fulfill its goals. – The efficacy of the ‘Strategy of Implosion’ advanced by the Resistance Network – led by Iran, Hezbollah, and Hamas – which rejects Israel’s existence based on Islamist and Arab-nationalist ideology. The Resistance Network aspires to precipitate Israel’s implosion by means of ‘overstretch’: sabotaging processes aimed at ending Israel’s control over Palestinians, advancing Israel’s delegitimization, and developing means of asymmetric warfare deployed against Israel’s military and civilian population. 60. The Reut Institute contends that combined, these forces represent a political-diplomatic strategic threat that may become existential. Resistance Network leaders repeatedly and publicly declare their goal of causing Israel’s implosion inspired by precedents set by the Soviet Union, South Africa, and other countries. This logic is ripening into a strategy that is yielding tangible gains.